The Psittacula species' history as pets goes back many centuries; the earliest parrot described in captivity was probably a Plum-headed Parakeet. Male-blue/grey head; black chin and stripe across lower cheeks; fine black line to sides of neck; broad emerald/green collar around hindneck; blue/grey upperparts; rump strongly washed with mauve/grey; yellow/green median wing coverts, forming visible patch on folded wing; deep blue tail tipped with pale yellow. Upper mandible red tipped with yellow, lower mandible brown. Eye pale yellow. Female-as in male but with minimal green on face. Black bill. Grey of head replaced by green; green stripe on neck faint; green rump suffused purple/blue. Bill orange. Eye grey. Calls are described as distinctive; in flight a harsh, chattering series of notes; flock in flight calls noisily. Walk-in enclosure minimum length 3m (9.8 ft). Small seed mix such as: canary, millet, and smaller amounts of oats, buckwheat, safflower and a little hemp; limited sunflower seed; spray millet; green leaves such as: Swiss chard, lettuce, dandelion, sowthistle, chickweed; seeding grasses; rearing food made from: hard-boiled eggs, wholegrain bread and carrot, all ground to crumbly consistency; fruits such as: apple, pear, orange, banana, pomegranate, cactus fruits; complete pellet. Bathing, swings, ladders, bird-safe wooden toys, non-toxic and unsprayed flowering, fir, pine, elder and willow branches, foraging/puzzle toys. Vertical box 8" x 8" x 20" (20.3cm x 20.3cm x 50.8cm). Declining due to habitat loss; also affected by the wild bird trade. SW to central southern Sri Lanka. Found up to 1700m (5576 ft) in well-wooded areas including moist forest, tea plantations and botanical gardens, and forest edge. Fruits of Macaranga tomentosa, wild fig and wild cinnamon, flowers of bomba tree, buds and nectar. Seen generally in pairs or small groups. Feeds in forest canopy, and, when done foraging, chatter loudly and continuously. 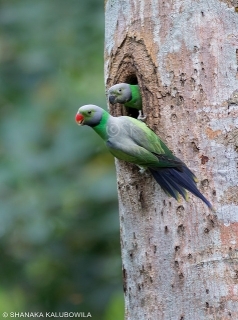 Compete fiercely with Plum-headed Parakeets for nesting sites.